As penance, I’m going to try to post something every day for the next week, so that you can catch up with what I’m doing. This morning, I crawled out of bed – reluctantly – at 6am, so that I could get to the lake for a swim. Yesterday, the weather was miserable, with lots of rain, so the clear skies this morning were a bit of a relief. I was quite organised last night, so all of my clothes were out ready and my bags were packed. I decided to brave my pearl izumi trisuit… I bought it from Sport Pursuit and had intended to blog about it, but failed. It looks great on the hanger, but less good on me. The never-ending diet should help that!!! However, it was also chilly, so I topped it off with a lovely fluorescent yellow cycling jacket. My lethargy and inclination to cycle at a pace equivalent to strolling, mean that it was nearly 7am when I arrived at the lake. Roelie was already there, but there weren’t many other people… And no-one appeared to be wearing just a trisuit. I had dithered about whether to wear a wetsuit or not, but my lazy side won as I couldn’t be bothered to carry it. 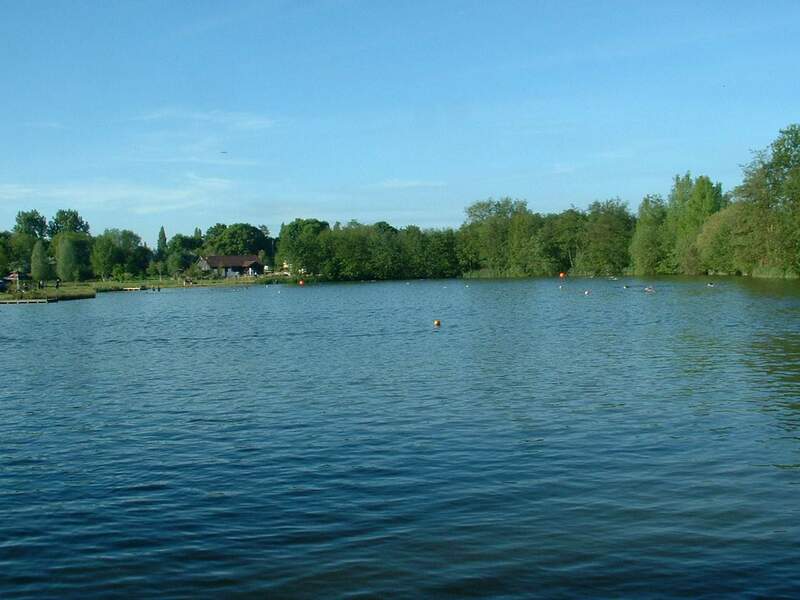 Fortunately, the lake was quite warm and after I managed to get my shoulders in, it felt ok. It was also my third opportunity to show off the ‘glamorous’ new hat that Stu bought for me. He thought the sight of sharks would intimidate Kev in our swimming lessons. I’m not sure whether it has worked – Kev has decided not to return to swimming lessons, but that’s probably because he has chosen to upgrade to swimfit. (I’ve signed up for one more set of lessons – this time with Gary as an accomplice – and then the RR10 season will be over, so I’ll persuade Stu to join me in swimfit classes). My marathon training schedule said that I needed to run after cycling home from work, but I was feeling lethargic and was tempted not to do it. However, I knew that once I had started, I would complete the workout. I also decided that after the success I had with setting intervals on my watch last time, that I would do that again. There are so many great functions on my Garmin that I’m not sure I’ll ever use them all! According to the schedule, I was meant to do 8x800m at 4:52/km… however, my schedule did not state how long my rests should be, and I’m well aware that the pace was calculated using my 10k PB and I’m nowhere near that level of fitness. 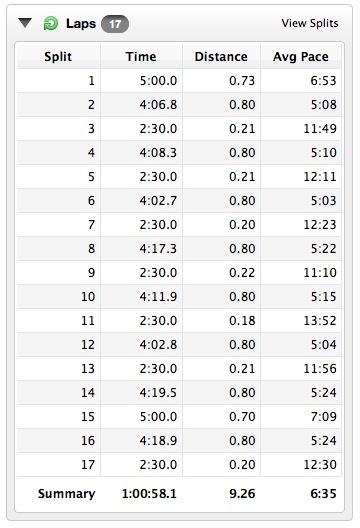 I decided to give myself some lee-way, so the watch was set with a pace band of 4:52-5:00/km. Unfortunately, I didn’t manage to stay at that pace, but I’m glad that I pushed myself to try and think that having the beep on my watch to nag me to speed up helped. I’ve also been out running in shorts most days in the last couple of months. This might not sound significant, but after all of the leg issues I had last year, I started using my skins tights as a crutch and started to believe that if I didn’t wear them I would be unable to run. I even wore them in Portugal, despite being worried about over-heating! My cellulite is on show for everyone to see, but at least I’m getting a tan!!! Tomorrow’s training was meant to be a swim at lunchtime, but I’ve got a lunch with work colleagues planned and will be marshalling at my club’s RR10 (a local league race), so I won’t be exercising in the evening. I need to decide whether to swim first thing or not. At some stage I also need to blog about the amazing machine that is my new bike. It is amazing… but I’m not going to spill the beans in this post about what it is and how beautiful it looks. I will also write about how incompetent I am with my “clipless pedals” and how nervous I am on my speed demon! My final bit of news is that I am desperately trying to stick to my diet. I’ve been good for a whole week, so am hoping that I will be able to find a salad at the pub for lunch tomorrow… although I think a cheese ploughmans may be my only option. I have also made the tough decision not to socialise after the RR10, as there is not a single healthy vegetarian option on the menu and I just don’t want to be tempted by other food. Fingers crossed my weigh in result will show how hard I’ve tried this week!